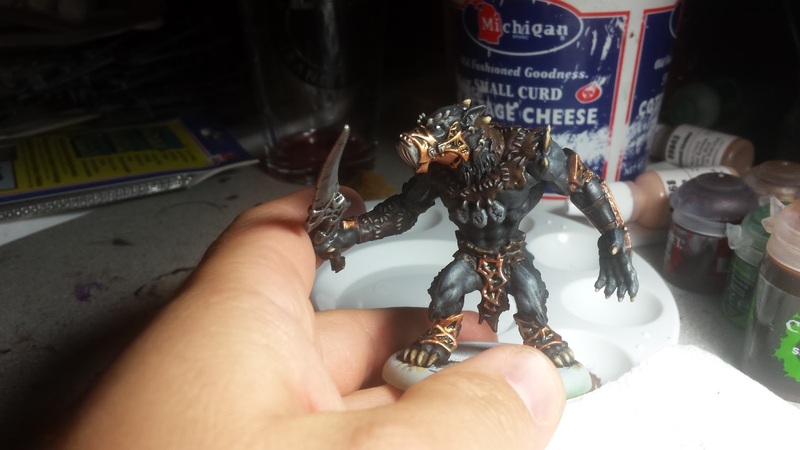 Brush Wizard: WIP: Krueger and Warpwolf Stalker Finished! 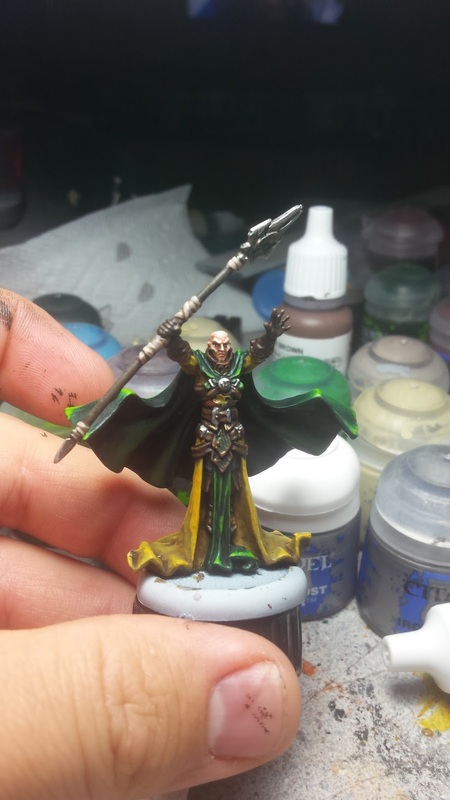 and simpler to paint than Kromac, thanks to which cloak and robes. 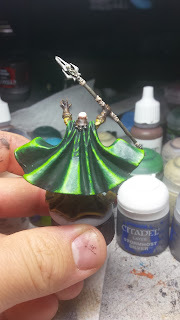 His robe turned out slightly more mustard than I would have liked, but it ended up looking good against the dark greens of the cloak and loincloth. Like Kromac, I kept most of his leather armor a dark brown, which is actually Rhinox Hide from Citadel. I have become a huge fan of that color lately and it works great for the base coat of rich deep brown leather. It suits these guys perfectly. His cloak was painted with Caliban Green, Warpstone Glow and Moot Green, the same colors I used for my Skitarii Rangers, only instead of wet blending I just did very thin layers. It looks a bit hyper contrasty in the picture, but on the table it looks really solid. The Warpwolf Stalker was also pretty simple as well. 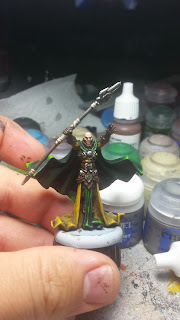 For him I decided to base coat everything in one go and then finish off all the details one after another, which seemed to speed up the progress a bit. 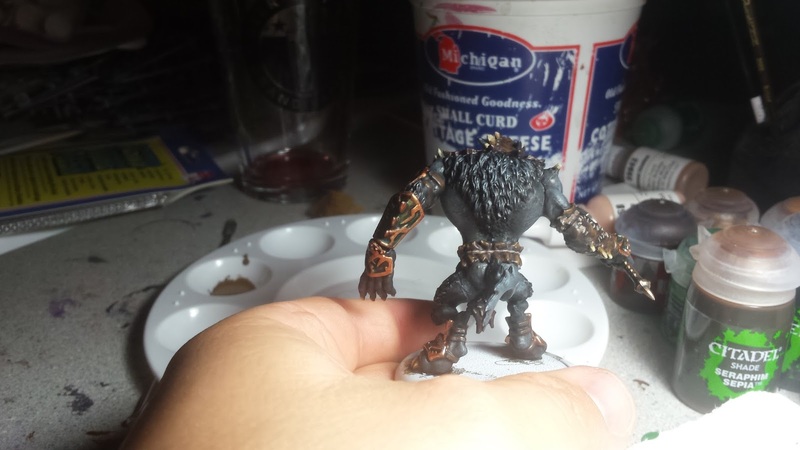 Though I ended up needing to do a bit of clean up on areas near the grey fur, since I drybrushed it and got a little sloppy. For both of these minis, I tried my hand at the official lacquered bronze armor that Circle models wear. 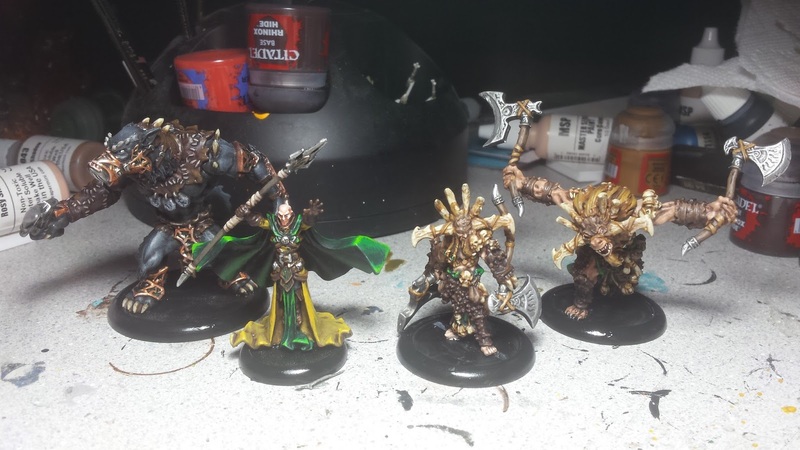 Thanks to my buddy Chris I was able to get a hold of the official tutorial from Privateer Press. For the most part it worked well, but on the smaller areas it was only alright. That's it for now, the next model is going to be the Ghetorix, another Heavy Warbeast. He looks like he's going to be fun.